The current events surrounding the confirmation hearing for Judge Brett Kavanaugh are on the hearts and minds of many. A large number of people are being activated regarding their own painful pasts and just the reality of the kinds of experiences described by Christine Blasey Ford and others. This week I recorded two mp3s and posted them to SoundCloud. My motivation is to help bring a larger perspective to the conversation while offering insights into healing individual and collective pain. The one on Kavanaugh was recorded first, and the other can be thought of as an extension of the teachings in it. Click on the images to listen for free. 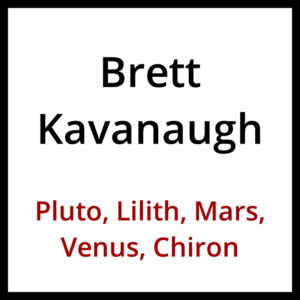 Evolutionary Astrologer Tom Jacobs describes various facets of Brett Kavanaugh’s multilife journey using his birth chart (Feb. 12, 1965, no time, Washington, DC). Covered: Pluto-Uranus in Virgo opposing asteroid Lilith-Chiron in Pisces square the nodes (including the meaning of asteroid Lilith (1181)), Mars retrograde square the nodes, Venus conjunct true Black Moon Lilith, South Node ruler in Taurus, and more. Evolutionary Astrologer, Energy Worker, Channel, and Medium Tom Jacobs (tdjacobs.com; healingsuicide.com) puts the Me Too era in context as a collective healing event, a major wave affect ing many more than anyone would have expected. Pluto entering Capricorn in 2008, the seven Uranus-Pluto squares from 2012-2015, and Jupiter’s entrance to Scorpio in 2017 form the backdrop of this teaching before Tom explains the current Pluto-Eris square (and several more that will continue until around 2023) as driving many more people to come forward with their histories of sexual abuse sparked by the U.S. Senate confirmation hearings of Brett Kavanaugh with testimony by Dr. Christine Blasey Ford. 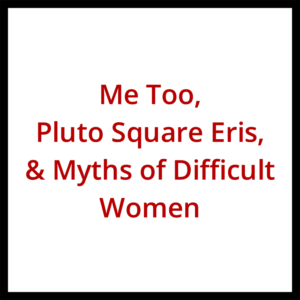 Tom then explains what he calls the myths of difficult women (Eris & Lilith) and how to heal each, as well as the importance of owning these parts of ourselves without shame or guilt as the only way to make this situation better.